We’ll Head Them Off At The Bypass! If you’re a pedal lover you’ll no doubt have an opinion on the concept of true bypass, that aspect of boutique pedal creation that defines many a marketing scheme. Buffers are bad, true bypass is expensive and good, buffered pedals are cheap and guff, and that’s the end of it. As is the case with all things in life, there’s a lot more to it than that, and the above statement is neither true nor the whole picture. 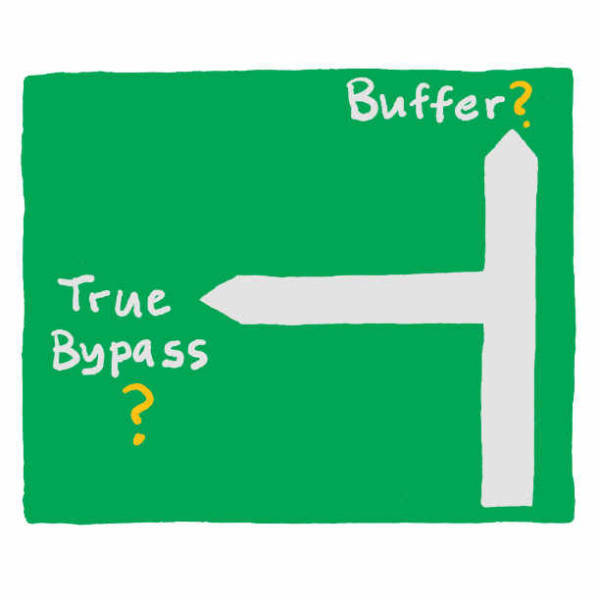 To this end, I did a whole lot of reading to bolster my existing real-world knowledge of the effects of buffering and true bypass, resulting in an article which I hope will clear up many misconceptions regarding this hotly-contested topic. First things first – what is true bypass? Well, true bypass is so described because it’s a method by which your input and output jacks are hardwired to bypass the entire circuit, so that when the pedal is inactive, it’s as if it wasn’t there, which leads to the ‘keeping your original tone pure’ angle. The difference between this and buffered pedals is that buffers are, in effect, micro preamps, which bump your signal up even when the pedal is turned off. The biggest argument when it comes to this is that buffered pedals sap your tone, drain your highs, and interfere with the original, pure signal, hence the broad defence of true bypass as being the definitive method for tonal purity. However, before your signal gets anywhere near the pedal, the truly pure sound of the string vibration into the pickup has to go through quite a bit. Your volume and tone pots, even at maximum, load the signal. Then that signal has to deal with the capacitance of your cable – and the quality of that cable – before it gets to the pedal. Already then, what is your pure signal? It’s a conglomeration of the parts involved in that specific guitar, in addition to the sound that you want to hear from your equipment. To clarify this, passive pickups have a high impedance – active pickups have low impedance. This means that passive pickups don’t cope as well with long cabling as their active cousins, and that if you take into consideration that your piffling signal has to get through north of 40ft of cable on average (20ft either side of even a single pedal), having a buffered pedal (or indeed a dedicated buffer) at the start of your signal path can go a long way to helping your sound overall. Numerous articles by companies like Roland, PMT and Neunaber talk about the cutoff for signal degradation being 18.5 ft of cable, so if you’re under that, you won’t notice any real difference. Over that, there’s likely to be some treble loss with true bypass, which again a buffer can help to correct. There’s a lot of upsides to the tone of a true bypass pedal. Drives can sound clearer, more open and natural than their buffered cousins, but this isn’t a hard and fast rule. The nature of the circuit can result in a popping noise when you’re turning them off and on – something that having a buffer in the signal path can help to rectify. Certain companies (Dr. Scientist etc) have tried to reduce this problem by using relay switching, which uses an electronic signal to activate the unit instead of a mechanical switch. ● Mix as you wish until you get the sound you want, with a buffered pedal (likely your tuner) at the start of the path. I hope you found this article helpful – let me know what you thought, and I’ll catch you next time! Don’t forget that when you have multiple buffert effects, like the Boss ones, it works cascade into noise. Because buffers are like micro-amps they amplify everything, so also noise. And it wouldn’t be that bad but if it goes into another buffer, it also amplifys the noise. And so on and so on. Hey Lex, thank you for your comments!